The digital display on this clock shows clearly the day and date. For people with dementia who may lose track of time, it also features a special reminder to spell out the time of day (e.g. It’s Sunday afternoon). Available in a range of languages: English (default), Spanish, French, German, Italian, Polish, Dutch, Welsh or others can be set. 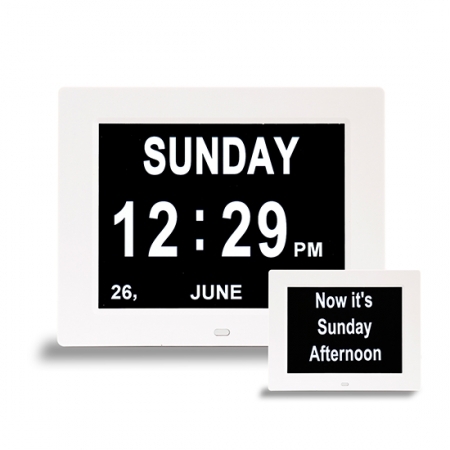 The clock auto detects and adjusts the displays brightness in day and night mode. Simple to set the time and date, the time mode can be set: 12Hours/24Hours, and the date mode can be set: Month-Day-Year/Day-Month-Year. Then once the time is set, the clock can be switched off and moved around the house without needing to be re-set. The clock is supplied with a UK power supply socket adaptor, (this clock requires plugging into a wall socket). Time mode can be set: 12Hours/24Hours. Display uses a white alphabet and black background for maximum contrast. Display size: 8 inch LED backlight.